As a full-sized luxury sedan, the new Chrysler 300 was designed to turn heads wherever it's driven. With sleek lines and a bold style, you'll love the appearance of this special vehicle. Mullen Motors can show you all of the different ways that you can customize it to suit your unique tastes. The Chrysler 300 is available with nine different wheel options. You'll have the choice of 17-, 18-, 19-, or 20-inch wheels, and you can select a color and finish that fits the specific style of your car. The Jeep Gladiator is a vehicle that has a rugged outer appearance but offers a smooth ride while on the road. When you look at the Gladiator, you'll notice that it looks like a combination of the classic Jeep style and a pickup as there is plenty of storage space in the bed. Are you looking for a light-duty pickup truck? Our team at Mullen Motors recommends the Ram 1500. This is a popular truck among consumers because it comes equipped with features that provide drivers with exceptional capability. The standard engine that is featured with the 1500 is the 3.6L Pentastar V6 engine with eTorque. It can produce 305 horsepower, which is best-in-class V6 horsepower, and 269 lb.-ft. of torque. The new Dodge Durango is a well-known and popular full-size SUV. The new Durango is available in a number of packages that include trailer based, anodized, and Mopar chrome options. While each of these packages offers specialized appearances and functions, all of them provide drivers with the fabled Durango power. The Dodge Durango comes fully equipped with a powerful 360 hp motor that is capable of operating at over 5,000 RPM. Backing up this powerful motor is 390 foot-pounds of torque. Underlying this horsepower and torque are 16 variable overhead valves supplying a V-8 motor. 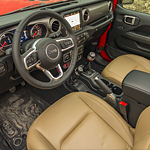 The Jeep Renegade is a stylish and tough midsize SUV. While this vehicle is quite comfortable in urban settings, it also has a wild side. The new Renegade offers drivers a multitude of features designed to optimize off-road experiences. These features include a special water fording capability and outstanding towing capacities. Many off-roading trails and roads require vehicles to cross relatively shallow bodies of water. Luckily, the new Jeep Renegade is made to excel in wet conditions. It employs a proprietary Trail Hawk system that seals off the body and critical electrical systems. If you are a dog owner and want to take your canine companion on road trips, you’ll want to make sure that your vehicle is as dog-friendly as possible. In addition to purchasing a vehicle at Mullen Motors that’s sizable enough for your dog after taking a test drive, you can make a few extra modifications to help your pet travel better. If you go out to your car on a cold morning and it has trouble starting, this is because the cold weather makes it harder on your battery. It takes some power to start your car, and a battery that sits all night in the cold is going to be sluggish. Drivers looking for a full-size luxury sedan will need to look no farther than the Chrysler 300. This popular car brings an exciting array of visual elements to the exterior design while giving drivers the kind of driving experience they expect from a luxury car. Drivers can customize their 300 from the ground up, starting with the tires. With nine different hubcap configurations and four tire sizes to choose from, the 300's road performance can be honed to the driver's specifications. Is the Ram 2500 on your list of potential purchases? Our team at Mullen Motors finds that this is a popular model because it offers class-exclusive and best-in-class features. This capable pickup truck comes with three available engines and two transmissions that you can choose from to personalize your truck. As formidable as the Jeep Wrangler is already as an off-road SUV, do you know that you can get its treasured attributes beefed up further by getting its Rubicon trim. Indeed, the Rubicon comes with a few exclusive features that make conquering less-than-ideal driving and weather conditions easier than ever.